Another porridge recipe, I know but I just damn well love the stuff. It’s so versatile where you can really add anything to it, although I haven’t gone savory because that just doesn’t look right and we have risotto for that kind of messing. 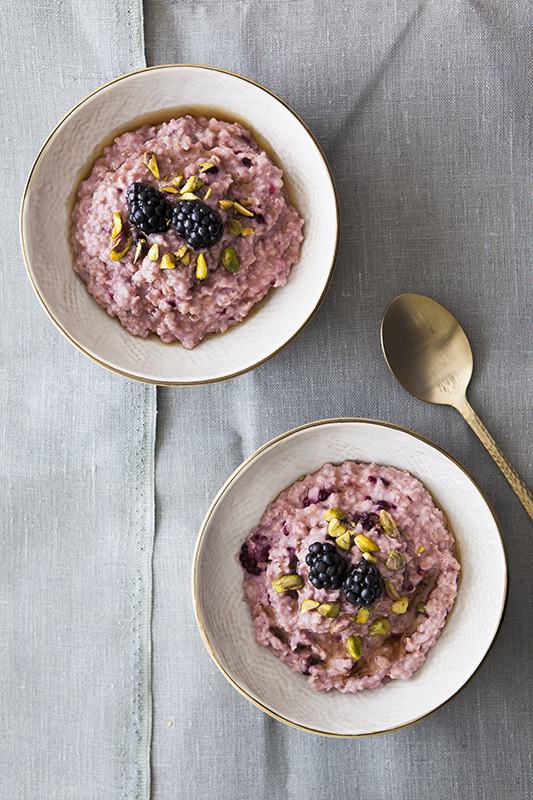 This porridge goes a beautiful pink colour because of the blackberries and also transforms from a porridge into something that tastes more like a blackberry pie or crumble, seriously! Place your oats, salt and milk into a medium sized saucepan over a medium heat and bring lightly to a boil. When it’s starting to thicken add in your blackberries and maple syrup. Keep stirring, the blackberries may need to be squashed, depending on how ripe they are. After about 5 mins your porridge should be cooked, pour into bowls and top with pistachios (if using) and some extra blackberries, and if you like it a bit sweeter drizzle a little more maple syrup on too.